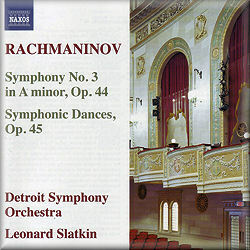 This CD very sensibly couples Rachmaninov’s two last orchestral works, both given their first performances in America. The latter was composed there during his final period of exile. In fact the Symphonic Dances, for a long time regarded as a work of lesser stature than the numbered symphonies, is symphonic in all but name. It might well have achieved a larger reputation during its early years if it had been called Symphony No. 4. It was not until the 1970s that it became a regular feature of the repertoire, and there are now more performances of it in the catalogues than of the Third Symphony. In point of fact neither of these works was warmly received at inception, at least when judged by the phenomenal success of Rachmaninov’s earlier compositions. RCA, who were only too eager to record Rachmaninov in his own piano music (including the complete concertos) and arrangements of music by others, reluctantly allowed him to record the Third Symphony but drew the line at committing to disc the Symphonic Dances, which they were convinced would not sell. In the event, by so doing they opened up a peculiar can of worms in the shape of an ambiguity in Rachmaninov’s otherwise typically precisely-notated score. Towards the end there are a series of cataclysmic strokes on the tam-tam (or gong) which progressively overwhelm the orchestra. It is left unclear whether the final stroke, which occurs on the very last beat of the score, should be rapidly damped or should be allowed to reverberate naturally beyond the end of the music. Eugene Ormandy - whose association with Rachmaninov’s music was of long standing - in his recording called for the final gong stroke to be immediately silenced. Although there is no marking to that effect in the score I am fairly sure this is what Rachmaninov would have expected. The alternative reading is a spectacular coup of orchestration, and in recent years it has found increasing degrees of advocacy from conductors such as André Previn and most recently Simon Rattle in a live Berlin performance. Despite the lack of any imprimatur from the composer such as would have been afforded by a marking laissez vibrer or some such indication in the score, I miss the thrill of the extended gong stroke nowadays in performances where it is not permitted – such as a live performance by David Atherton in Cardiff which I reviewed for Seen and Heard last year. It is just a pity that the proposed RCA recording with the composer conducting, which would incontrovertibly have resolved the matter once and for all, was never made. Here Slatkin adopts the more modern laissez vibrer approach to the final chord, and the result is extremely spectacular with the gong stroke actually seeming to make a crescendo after the orchestra has stopped playing - as is the natural inclination of the instrument. Earlier however he has seemed to take a very straightforward view of the score, emphasising the dance rhythms at the expense of the symphonic elements. At the end of the first movement Rachmaninov inserts a quotation from his own First Symphony which clearly had great personal significance for him. At the time of the Symphonic Dances nobody would have recognised this quotation, because Rachmaninov himself had destroyed the original score of the symphony following its disastrous première in Russia; the work was only reconstructed from orchestral parts after his death. In any event the presence in his final orchestral work of a reminiscence of that early catastrophe in his career makes the music all the more poignant. Most conductors make a feature of this citation, almost enclosing the luminous restatement of the theme in inverted commas. Here Slatkin is almost matter-of-fact, treating the theme as part of the natural development of the music. It is a tenable point of view, but it seems to overlook the autobiographical significance which the moment clearly had for the composer. The performance of the Third Symphony is similarly slightly lacking in the passionate involvement that this highly emotional music seems to demand. Slatkin appears to be making a conscious attempt to de-mystify Rachmaninov, to demonstrate the essential unity of the symphonic writing at the expense of the individual moment. That said, Rachmaninov is nothing if not romantically expressive, and Slatkin’s approach downgrades this aspect. Nor is the recorded balance altogether ideal – at a couple of points the muted horns, whose snarling stopped notes form an essential element in the texture, are almost inaudible in their context. The startling introduction by the composer of a saxophone solo in the first movement of the Symphonic Dances (track 4, 3.57) finds the expressive player somewhat backwardly placed. Nonetheless for listeners who remain to be converted to these beautiful swan songs by a great composer, this is a valuable disc in that it gives us a portrait of Rachmaninov as a traditional symphonist rather than as the composer of a last effusive outpouring of Russian romanticism. The playing is superb throughout.